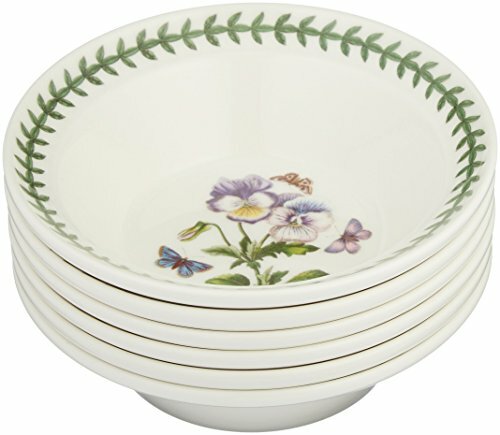 In 1972, Portmeirion Founder and Designer, Susan Williams-Ellis, created one of the worlds most popular dinnerware patterns, Botanic Garden. To this day this pattern continues to grow and thrive with new flowers, colors and shapes. The pattern has many rich floral motifs usually found in English gardens and are always enhanced with an Ivy border. These designs are used throughout the extensive collection of Dinnerware, Serve ware, Bake ware and Decorative items for the home. 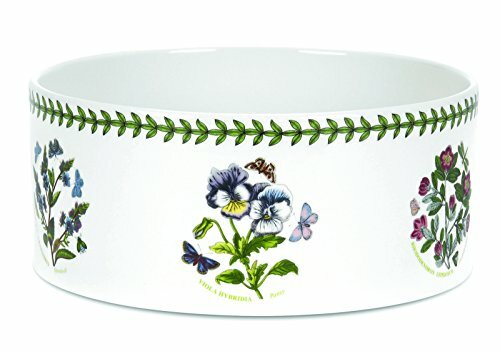 Watch your garden continue to grow with this 8.0" Souffle Dish made of fine porcelain. Bake and Serve with this freezer safe, oven safe to 400 degrees, microwave safe and dishwasher safe souffle dish. In 1972, Portmeirion Founder and Designer, Susan Williams-Ellis, created one of the worlds most popular dinnerware patterns, Botanic Garden. To this day this pattern continues to grow and thrive with new flowers, colors and shapes. The pattern has many rich floral motifs usually found in English gardens and are always enhanced with an Ivy border. These designs are used throughout the extensive collection of Dinnerware, Serve ware, Bake ware and Decorative items for the home. 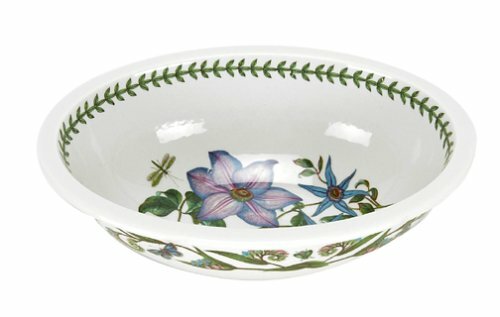 Watch your garden continue to grow with the 15.0" Oval Serving Dish made of fine porcelain. In 1972, Portmeirion Founder and Designer, Susan Williams-Ellis, created one of the worlds most popular dinnerware patterns, Botanic Garden. To this day this pattern continues to grow and thrive with new flowers, colors and shapes. The pattern has many rich floral motifs usually found in English gardens and are always enhanced with an Ivy border. These designs are used throughout the extensive collection of Dinnerware, Serve ware, Bake ware and Decorative items for the home. Watch your garden continue to grow with the 2 quart capacity Medium Roasting Dish measuring 13.5" x 9.5". Made of fine porcelain you can cook and serve with this freezer safe, oven safe to 400 degrees, microwave safe and dishwasher safe roaster. Artist Susan Williams-Ellis found her inspiration for Botanic Garden from antique botanical Illustration plates. The mix and match collection currently features around 30 individual floral and butterfly designs with the signature leaf motif border. This colorful dinnerware collection is complimented with a large range of bakeware, serving items and giftware. Botanic Garden has decorated homes all over the world for over 30 years. Start your collection today and watch your Botanic Garden grow. Set of 6 Oatmeal Soup Bowls in assorted motifs. 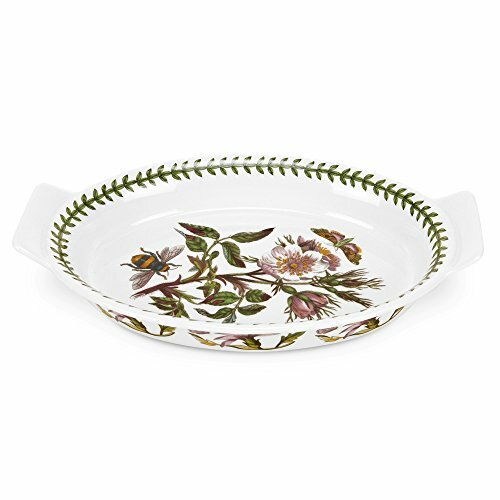 In 1972, Portmeirion Founder and Designer, Susan Williams-Ellis, created one of the worlds most popular dinnerware patterns, Botanic Garden. To this day this pattern continues to grow and thrive with new flowers, colors and shapes. The pattern has many rich floral motifs usually found in English gardens and are always enhanced with an Ivy border. These designs are used throughout the extensive collection of Dinnerware, Serve ware, Bake ware and Decorative items for the home. 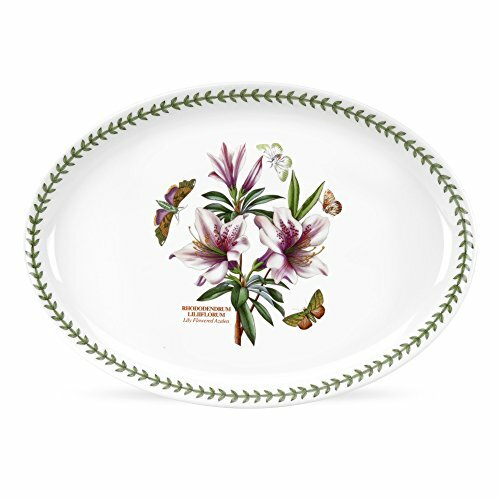 Watch your garden continue to grow with the 9.0" Medium Oval Gratin Dish made of fine porcelain. Cook and Serve with this freezer safe, oven safe to 400 degrees, microwave safe and dishwasher safe gratin dish. Artist Susan Williams-Ellis found her inspiration for Botanic Garden from antique botanical Illustration plates. The mix and match collection currently features around 30 individual floral and butterfly designs with the signature leaf motif border. This colorful dinnerware collection is complimented with a large range of bakeware, serving items and giftware. Botanic Garden has decorated homes all over the world for over 30 years. Start your collection today and watch your Botanic Garden grow. Set of 6 breakfast cups and saucers with round traditional shape in assorted motifs. In 1972, Portmeirion Founder and Designer, Susan Williams-Ellis, created one of the worlds most popular dinnerware patterns, Botanic Garden. To this day this pattern continues to grow and thrive with new flowers, colors and shapes. The pattern has many rich floral motifs usually found in English gardens and are always enhanced with an Ivy border. These designs are used throughout the extensive collection of Dinnerware, Serve ware, Bake ware and Decorative items for the home. 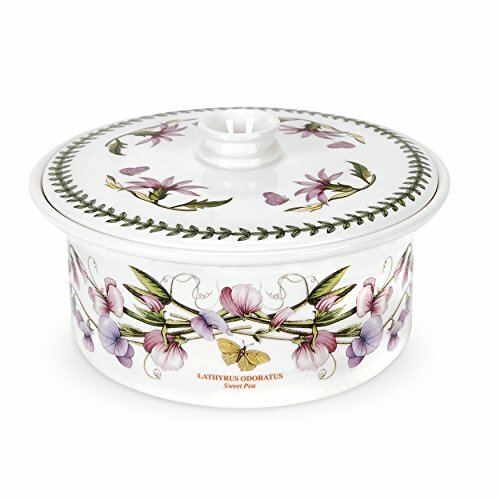 Watch your garden continue to grow with the 3 pint Covered Casserole made of fine porcelain. Cook and Serve with this freezer safe, oven safe to 400 degrees, microwave safe and dishwasher safe casserole. In 1972, Portmeirion Founder and Designer, Susan Williams-Ellis, created one of the worlds most popular dinnerware patterns, Botanic Garden. To this day this pattern continues to grow and thrive with new flowers, colors and shapes. The pattern has many rich floral motifs usually found in English gardens and are always enhanced with an Ivy border. These designs are used throughout the extensive collection of Dinnerware, Serve ware, Bake ware and Decorative items for the home. 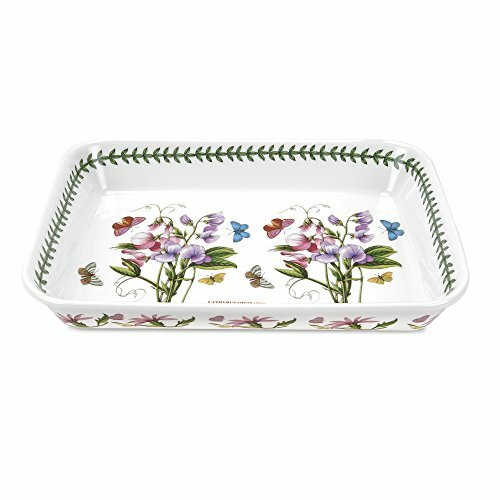 Watch your garden continue to grow with the 15.0" x 11.0" Lasagna Dish made of fine porcelain. Cook and Serve with this freezer safe, oven safe to 400 degrees, microwave safe and dishwasher safe lasagna dish. Artist Susan Williams-Ellis found her inspiration for Botanic Garden from antique botanical Illustration plates. The mix and match collection currently features around 30 individual floral and butterfly designs with the signature leaf motif border. This colorful dinnerware collection is complimented with a large range of bakeware, serving items and giftware. Botanic Garden has decorated homes all over the world for over 30 years. Start your collection today and watch your Botanic Garden grow. The medium deep oval dish is perfect for side dishes. It is part of the new sovereign shape collection. In 1972, Portmeirion Founder and Designer, Susan Williams-Ellis, created one of the worlds most popular dinnerware patterns, Botanic Garden. To this day this pattern continues to grow and thrive with new flowers, colors and shapes. The pattern has many rich floral motifs usually found in English gardens and are always enhanced with an Ivy border. These designs are used throughout the extensive collection of Dinnerware, Serve ware, Bake ware and Decorative items for the home. 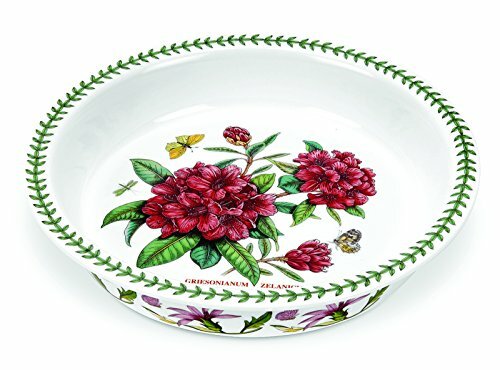 Watch your garden continue to grow with this 10.75", 1.5 quart Pie Dish made of fine porcelain. Bake and Serve with this freezer safe, oven safe to 400 degrees, microwave safe and dishwasher safe pie dish. 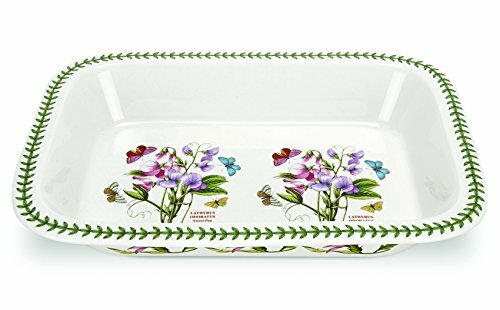 Compare prices on Portmeirion Botanic Garden Bakeware at LiveSaler.com – use promo codes and coupons for best offers and deals. We work hard to get you amazing deals and collect all avail hot offers online and represent it in one place for the customers. Now our visitors can leverage benefits of big brands and heavy discounts available for that day and for famous brands. We try to makes comparison shopping easy with Product Reviews, Merchant Ratings, Deal Alerts & Coupons. Find Deals, Compare Prices, Read Reviews & Save Money.